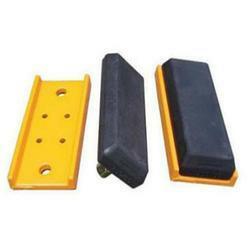 Providing you the best range of rubber track pads with effective & timely delivery. Quality in the hallmark of our company, in order to meet quality standards we are engaged in offering a large range of Rubber Track Pads. The offered products are suitable for sensor paver machine and excavator and manufactured at our vendor’s end in the medium grade polyurethane the best qualities of polyurethane and high quality rubber that provides a durable and long life. Our products are conventional and interchangeable short pitch types. Besides these, the products we offer are designed for low ground pressure application in constructional and agricultural equipments.